The new 2019 Spark is here to help you stay safe, plugged in and turning heads on your next adventure. 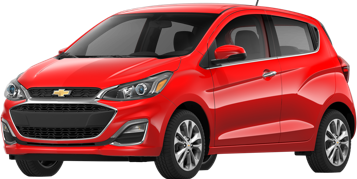 Bold design and vibrant new colors like Caribbean Blue Metallic, Orange Burst Metallic, Raspberry, and Passion Fruit make Spark the subcompact car that’s easy on the eyes and hard to ignore. Nimble handling and an efficient, EPA-estimated 38 MPG highway make the fun-size Spark the perfect car for hitting the open road. Meet your smartphone’s new best friend. 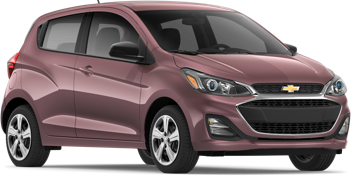 Offering available 4G LTE Wi-Fi®, two USB ports and seamless connectivity with the available Chevrolet Infotainment 3 system, Spark is ready to keep you charged up and in the know even when you’re on the go. Spark may be small, but with 10 standard airbags, a high-strength steel safety cage and available advanced active safety features, it can help you stay safe on your next big adventure. Max Horsepower: 98. 1.4L ECOTEC 4-cylinder engine. What are you waiting for? Test drive a Chevy today!